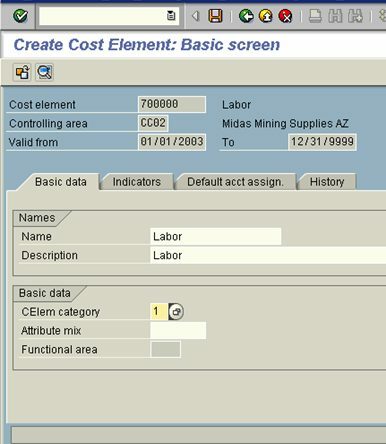 Enter the account # 700000 Labor Expense into the Cost Element field, and click enter. If you have not created this G/L account previously, you will need to at this point. See the accounts and descriptions below for a list of accounts needed to create the primary cost elements. From here you will be at the following screen. Enter the following Cost Element numbers with the corresponding Cost element category numbers clicking save after creating each Cost element. Enter a validation date of 01/01/2003 to 12/31/9999. Note: As mentioned in the introduction to this section, the secondary cost elements are used only for internal recordkeeping, and therefore should NOT have corresponding G/L accounts!